This is from the same Japanese site as the previous Simple White Loaf. 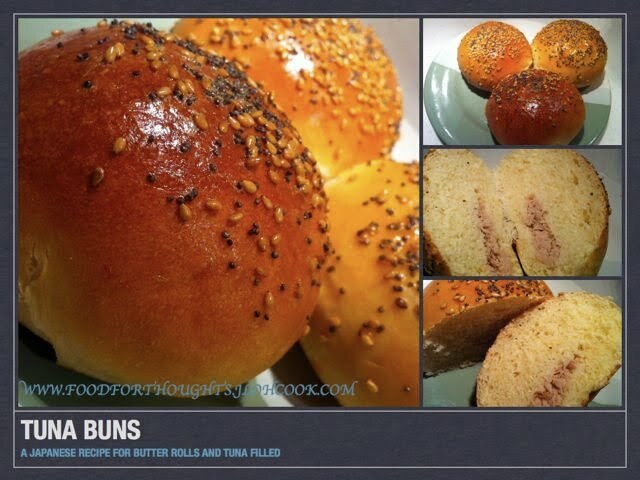 http://kneader.jp/recipe/12. This is quite a simple recipe. Mix the 1st group of ingredients together, leave it for 1/2 hour. Add in the rest of ingredients, mix well. Add the butter last. As it is quite a wet dough, I did the slap and turn method by Richard Bertinet's Sweet Dough Kneading Method. The dough came together really well. Put aside to let is proof, double the size. I did 1 stretch and fold to ensure that the dough come together better. After 1.5 hours, the dough rose nicely. Rolled it gently into a long block and cut the dough up into 8 pieces. Roll each of the pieces into rounds and leave it for 20 mins. After 20 mins, flatten the dough using the palm gently without degassing the dough. Add 1 heap teaspoon of tuna in the middle, fold in the ends of the dough to the middle meeting each other, and roll into ball. Using part of the egg coat the top and sprinkle some poppy seeds and white sesame seeds on top. Leave to proof for 1 hour. Mean while, heat up the oven to 190 degree celsius. You can leave the rolls to proof on metal sheet laid with baking sheet. Before baking, brush the loaf with egg wash, bake for 15 mins or until golden brown. This bun is suppose to be butter rolls. Interestingly, it is not too sweet, and goes well with Tuna. I think it might go well with Red Bean. I might just try to do that next time. Yes! These buns were eaten within 1 day, and best eaten when it's warm. Re-heat it in the oven for 3 mins at 180 degree celsius. Canned Tuna in spring water, pour out the water.